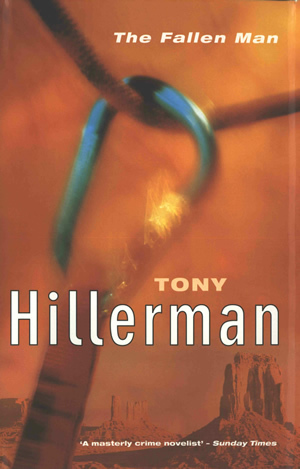 This is the hardcover first UK edition of The Fallen Man by Tony Hillerman, published in 1997 by Michael Joseph, London. On the dust jacket, the composite photograph is by Tony Stone Images and shows a turquoise carabiner around a climbing rope above a landscape of red sandstone formations in the lower right. The author's name is printed in white in large type, with the book title in white at the top right. On the back cover, the image of the carabiner and rope is repeated, opacified against a brown background. Several media quotes praise the novel, printed in white. The bar code is printed at the bottom of the back cover. Binding: Full-color paper covers. On the spine, the author's name and book title are printed above the mermaid logo.